Michael Faraday (22 September 1791 – 25 August 1867) was an English chemist and physicist (or natural philosopher, in the terminology of the time) who contributed to the fields of electromagnetism and electrochemistry. I have far more confidence in the one man who works mentally and bodily at a matter than in the six who merely talk about it.. Nature is our kindest friend and best critic in experimental science if we only allow her intimations to fall unbiassed on our minds. Without experiment I am nothing. Learn that which is already known to others, and then by the light and methods which belong to science … learn for ourselves and for others; so making a fruitful return to man in the future for that which we have obtained from the men of the past. I shall be with Christ, and that is enough. He hath set his testimony in the heavens. ALL THIS IS A DREAM. Still examine it by a few experiments. Nothing is too wonderful to be true, if it be consistent with the laws of nature; and in such things as these, experiment is the best test of such consistency. Laboratory journal entry #10,040 (19 March 1849); published in The Life and Letters of Faraday (1870) Vol. II, edited by Henry Bence Jones , p. 248. This has sometimes been quoted partially as "Nothing is too wonderful to be true," and can be seen engraved above the doorway of the south entrance to the Humanities Building at UCLA in Los Angeles, California. It is the great beauty of our science, chemistry, that advancement in it, whether in a degree great or small, instead of exhausting the subjects of research, opens the doors to further and more abundant knowledge, overflowing with beauty and utility. Letter to John Tyndall (19 April 1851); letter 2411, edited by Frank A. J. L. James (1999). The correspondence of Michael Faraday, Volume 4. IET. p. 281. ISBN 0863412513. I was at first almost frightened when I saw such mathematical force made to bear upon the subject, and then wondered to see that the subject stood it so well. As quoted in The Life and Letters of Faraday (1870) Vol. II, edited by Henry Bence Jones, p. 483; also engraved above the doorways of the Pfahler Hall of Science at Ursinus College in Collegeville, Pennsylvania (see photo). If you would cause your view … to be acknowledged by scientific men; you would do a great service to science. If you would even get them to say yes or no to your conclusions it would help to clear the future progress. I believe some hesitate because they do not like their thoughts disturbed. Royal Institution Lecture On Mental Education (6 May 1854), as reprinted in Experimental Researches in Chemistry and Physics, by Michael Faraday, 1859, pp 474-475, emphasis verbatim. We learn by such results as these, what is the kind of education that science offers to man. It teaches us to be neglectful of nothing, not to despise the small beginnings — they precede of necessity all great things. Vesicles make clouds; they are trifles light as air, but then they make drops, and drops make showers, rain makes torrents and rivers, and these can alter the face of a country, and even keep the ocean to its proper fulness and use. It teaches a continual comparison of the small and great, and that under differences almost approaching the infinite, for the small as often contains the great in principle, as the great does the small; and thus the mind becomes comprehensive. It teaches to deduce principles carefully, to hold them firmly, or to suspend the judgment, to discover and obey law, and by it to be bold in applying to the greatest what we know of the smallest. It teaches us first by tutors and books, to learn that which is already known to others, and then by the light and methods which belong to science to learn for ourselves and for others; so making a fruitful return to man in the future for that which we have obtained from the men of the past. Bacon in his instruction tells us that the scientific student ought not to be as the ant, who gathers merely, nor as the spider who spins from her own bowels, but rather as the bee who both gathers and produces. All this is true of the teaching afforded by any part of physical science. Electricity is often called wonderful, beautiful; but it is so only in common with the other forces of nature. The beauty of electricity or of any other force is not that the power is mysterious, and unexpected, touching every sense at unawares in turn, but that it is under law, and that the taught intellect can even now govern it largely. The human mind is placed above, and not beneath it, and it is in such a point of view that the mental education afforded by science is rendered super-eminent in dignity, in practical application and utility; for by enabling the mind to apply the natural power through law, it conveys the gifts of God to man. No wonder that my remembrance fails me, for I shall complete my 70 years next Sunday (the 22); — and during these 70 years I have had a happy life; which still remains happy because of hope and content. I am, I hope, very thankful that in the withdrawal of the powers and things of life, the good hope is left with me, which makes the contemplation of death a comfort — not a fear. Such peace is alone the gift of God, and as it is He who gives it, why should we be afraid? His unspeakable gift in His beloved Son is the ground of no doubtful hope, and there is the rest for those who )like you and me) are drawing near the latter end of our terms here below. I do not know, however why I should join you with me in years. I forget your age, but this I know (and feel as well) that next Sabbath day (the 22nd) I shall complete my 70th year. I can hardly think myself so old as I write to you — so much of cheerful spirit, ease and general health is left to me, and if my memory fails, why it causes that I forget troubles as well as pleasure and the end is, I am happy and content. Speculations? I have none. I am resting on certainties. I know whom I have believed and am persuaded that he is able to keep that which I have committed unto him against that day. As when on some secluded branch in forest far and wide sits perched an owl, who, full of self-conceit and self-created wisdom, explains, comments, condemns, ordains and order things not understood, yet full of importance still holds forth to stocks and stones around — so sits and scribbles Mike. Whereas, according to the declaration of that true man of the world Talleyrand, the use of language is to conceal the thoughts; this is to declare in the present instance, when I say I am not able to bear much talking, it means really, and without any mistake, or equivocation, or oblique meaning, or implication, or subterfuge, or omission, that I am not able; being at present rather weak in the head, and able to work no more. Penciled note on a scrap of paper in the early 1840's following a physical and mental breakdown, possibly due to mercury poisoning. Why, sir, there is every probability that you will soon be able to tax it. Faraday's purported reply to William Gladstone, then British Chancellor of the Exchequer (minister of finance), when asked of the practical value of electricity (1850) as quoted in Democracy and Liberty (1899) by William Edward Hartpole Lecky, p. xxxi , and in Discovery Or The Spirit And Service Of Science (1918) by R.A Gregory, p 3. The variant "One day sir, you may tax it." is given in The Harvest of a Quiet Eye : A Selection of Scientific Quotations (1977), p. 56, but they source it to Discovery which differs in its quote. According to Snopes in "Long Ago and Faraday", it is most likely an invented quotation, as there are no contemporaneous records, though Lecky did live through the same time as Faraday and Gladstone. Whatever our opinions, they do not alter nor derange the laws of nature. Coulometer: it was not until after Faraday's death that the significance of his laws of electrolysis for atomic theory was realized. Faraday found no conflict between his religious beliefs and his activities as a scientist and philosopher. He viewed his discoveries of nature's laws as part of the continual process of "reading the book of nature", no different in principle from the process of reading the Bible to discover God's laws. A strong sense of the unity of God and nature pervaded Faraday's life and work. Faraday was the first scientist to realise the enormous importance of the electromagnetic field. He saw in it a reality of a new category differing from matter. It was capable of transmitting effects from place to place, and was not to be likened to a mere mathematical fiction such as the gravitational field was then assumed to be. In his opinion, the phenomena of electricity and magnetism should be approached via the field rather than via the charged bodies and currents. In other words, according to Faraday, when a current was flowing along a wire, the most important aspect of the phenomenon lay not in the current itself but in the fields of electric and magnetic force distributed throughout space in the current's vicinity. It is this elevation of the field to a position of preeminence that is often called the pure physics of the field. Faraday was not a mathematician and was unable to co-ordinate the phenomena he foresaw in a mathematical way, and derive the full benefit from his ideas. Before dying, however, he entrusted this task to his colleague Maxwell; and one of the most astonishing theories of science, eclipsed only in recent years by Einstein's theory of relativity, was the outcome. Would Faraday have discovered the law of electromagnetic induction if he had received a regular college education? Albert Einstein, "On the Generalized Theory of Gravitation," Scientific American 182, no. 4 (April 1950): 14. When his faculties were fading fast, he would sit long at the western window, watching the glories of the sunset; and one day, when his wife drew his attention to a beautiful rainbow that spanned the sky, he looked beyond the falling shower and the many-colored arch, and observed, "He hath set his testimony in the heavens." On August 25, 1867, quietly, almost imperceptively, came the release. There was a philosopher less on earth, and a saint more in heaven. Study of the conduction of electricity in liquids became possible at the beginning of the nineteenth century, following the discovery of the electrolytic cell by Volta in 1800, which provided the first continuous source of electric current. It was soon discovered that the conduction of electricity by solutions is accompanied by chemical reactions at the electrodes which serve to conduct the current into and out of the solution. Nicholson and Carlisle demonstrated the decomposition of water into hydrogen and oxygen by a current in 1801. Davy's discovery of sodium and potassium metals by electrolysis of moist soda and [caustic] potash was a striking example of the novelty of electrochemical decomposition. Many of the phenomena of electrolysis were already known when Michael Faraday began his researches. (1) that the amount of chemical decomposition produced by an electric current (that is, the mass of substance deposited or dissolved at an electrode) is proportional to the quantity of electricity passed. (2) that the amounts of different substances released or dissolved at electrodes by the same quantity of electricity are proportional to their chemical equivalents. From the second law, it follows that the amount of electricity required to liberate or dissolve one equivalent weight of any substance by electrolysis is constant. It was not until after Faraday's death that the significance of his laws of electrolysis for atomic theory was realized. In 1881 von Helmholtz pointed out that if elementary substances are composed of atoms, it follows from Faraday's laws of electrolysis that electricity also is composed of elementary portions which behave like atoms of electricity. Investigations on the conduction of electricity by gases led to the identification of the electron as the fundamental unit of electricity at the end of the century. Faraday's positive and negative ions are therefore atoms (or groups of atoms or radicals)) with a deficiency or an excess of an integral number of electrons, where the integral number is the valency of the atom. The ions move in opposite directions through the solution to the electrodes where their charges are neutralised, causing them to be discharged to neutral atoms or radicals. These are the primary electrode reactions, of which the deposition of silver on a platinum cathode in the silver coulometer is a typical example. He was little interested mathematics or theory; for example, when his ideas on magnetic fields were extensively developed later by James Clerk Maxwell (1831-1879), Faraday was little concerned with the results. His own scientific career was characterized by simple ideas and simple experiments. In 1831 his original researches began to center about the relation of electricity and magnetism. ...Even as early as 1824 he had noticed the effects of a current of electricity upon a magnet. Now he found that this electrical action could be increased if the wire carrying the current was made into a coil. From that point he went on to study the push or pulling action of the coil upon the magnet, the effect of having a coil of more turns, and a way by which the coil and magnet, if free to move, could be made to move around each other. He was working out the principles that operate in today's electric motors. By 1831 he had reversed the problem... He had shown that the mere motion of the magnet within a closed-end coil was enough to set moving through the coil a small current that had not been there before. He called this new current an "induced" one and proceeded to study how the current could be increased in its quantity and intensity. The experimental results were revolutionary. The principles of induction discovered by Faraday are used today in telephones, induction coils, electric generators, transformers, the motors of electric clocks, and dozens of other pieces of electrical equipment. As a philosopher, his first great characteristic was the trust which he put in facts. He said of himself, "In early life I was a very lively imaginative person, who could believe in the Arabian Nights as easily as in the Encyclopedia, but facts were important to me, and saved me. I could trust a fact." Over and over again he showed his love of experiments in his writings and lectures: "Without experiment I am nothing." "But still try, for who knows what is possible?" "All our theories are fixed upon uncertain data, and all of them want alteration and support from facts." "One thing, however, is fortunate, which is, that whatever our opinions, they do not alter nor derange the laws of nature." His second great characteristic was his imagination. It rose sometimes to divination, or scientific second sight, and led him to anticipate results that he or others afterwards proved to be true. I have been favoured by a sight of the forthcoming series of Dr. Faraday's admirable "Researches;" in which that assiduous and successful philosopher labours to prove by experiment that electrical induction is transmitted to distant bodies by intervening matter. Faraday is, and must always remain, the father of that enlarged science of electro-magnetism. 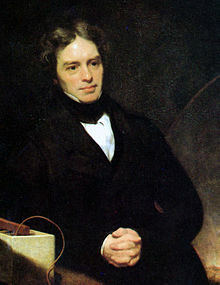 To estimate the intensity of Faraday's scientific power, we cannot do better than read the first and second series of his Researches and compare them...with the whole course of electro-magnetic science since, which has added no new idea to those set forth, but has only verified the truth and scientific value of every one of them. His health [was] probably affected by mercury poisoning. This was a then unrealized health hazard that undoubtedly affected many nineteenth-century scientists who worked in the laboratory, where spilled mercury often accumulated between and beneath floorboards and generated a permanent atmosphere of mercury vapor. Faraday carried on experimenting until he was over 70. He died in 1867, the year that Das Kapital was published, and he was buried in Highgate cemetery... where Marx was to join him later. Gradually... during the second half of the nineteenth century, the uncomfortable feeling of dislike of the action at a distance, which had been so strong in Huygens and other contemporaries of Newton, but had subsided during the eighteenth century, began to emerge again, and gained strength rapidly. This was favoured by the purely mathematical transformation (which can be compared in a sense with that from the Ptolemaic to the Copernican system), replacing Newton's finite equations by the differential equations, the potential becoming the primary concept, instead of the force, which is only the gradient of the potential. These ideas, of course, arose first in the theory of electricity and magnetism or perhaps one should say in the brain of Faraday. A point highly illustrative of the character of Faraday now comes into view. He gave an account of his discovery of Magneto-electricity in a letter to his friend M. Hachette, of Paris, who communicated the letter to the Academy of Sciences. The letter was translated and published ; and immediately afterwards two distinguished Italian philosophers took up the subject, made numerous experiments, and published their results before the complete memoirs of Faraday had met the public eye. This evidently irritated him. He reprinted the paper of the learned Italians in the Philosophical Magazine accompanied by sharp critical notes from himself. He also wrote a letter dated Dec. 1,1832, to Gay Lussac, who was then one of the editors of the Annales de Chimie in which he analysed the results of the Italian philosophers, pointing out their errors, and' defending himself from what he regarded as imputations on his character. The style of this letter is unexceptionable, for Faraday could not write otherwise than as a gentleman; but the letter shows that had he willed it he could have hit hard. We have heard much of Faraday's gentleness and sweetness and tenderness. It is all true, but it is very incomplete. You cannot resolve a powerful nature into these elements, and Faraday's character would have been less admirable than it was had it not embraced forces and tendencies to which the silky adjectives "gentle" and "tender" would by no means apply. Underneath his sweetness and gentleness was the heat of a volcano. He was a man of excitable and fiery nature; but through high self-discipline he had converted the fire into a central glow and motive power of life, instead of permitting it to waste itself in useless passion. "He that is slow to anger" saith the sage, "is greater than the mighty, and he that ruleth his own spirit than he that taketh a city." Faraday was not slow to anger, but he completely ruled his own spirit, and thus, though he took no cities, he captivated all hearts. The experimental researches of Faraday are so voluminous, their descriptions are so detailed, and their wealth of illustration is so great, as to render it a heavy labour to master them. The multiplication of proofs, necessary and interesting when the new truths had to be established, are however less needful now when these truths have become household words in science. The conception of lines of force was introduced by Faraday to form a mental picture of the processes going on in the electric field. To him these lines were not mere mathematical abstractions. He ascribed to them properties that gave them a real physical significance. They terminate on opposite charges, are always in a state of tension, tending to shorten themselves, and are mutually repellent. The direction of a line of force at any point gives the direction of the field at that point. With the help of these properties of lines of force it is possible to obtain an idea of the distribution of the intensity of the field surrounding electrically charged bodies. The idea of tubes of force has been introduced to make the method of Faraday metrical rather than merely descriptive. A tube of force is obtained by drawing a number of lines of force through the boundary of any small closed curve. The lines then form a tubular surface, which, it can be proved, will never be cut by any lines of force, and the extremities of which enclose equal and opposite charges. By properly choosing the area of the surface enclosed by the curve through which the lines are drawn the extremities of the tube can be made to enclose unit charge. Such a unit tube is called a Faraday tube. Maxwell and J. J. Thomson have made an exhaustive study of these tubes of force and expressed their properties in mathematical terms. The result that interests us here is that a tube of force behaves as though it had inertia, so that in order to move a tube work must be done. This explains why a charge behaves as if it had mass. It must be remarked that the conception of tubes of forces is used here merely to aid in understanding the phenomena. Whether or not tubes of force, or even the ether, possess any physical significance is a question. Modern developments seem to indicate that this question must be answered in the negative. Hendrik Johannes Van der Bijl, The Thermionic Vacuum Tube and Its Applications (1920) pp. 3-4. This page was last edited on 7 December 2018, at 19:52.